By the end of 2013, Roberta Firstenberg was losing her battle with cancer. After several months of radiation therapy and chemotherapy, she was told that the treatments were no longer effective. It was around this time that her granddaughter, Priscilla Firstenberg – a 2D and 3D video game artist – moved in to help take care of her. Pri would come home after work each night and sit with her grandma. The two would talk long into the evening until Roberta fell asleep. It was during this time that Pri decided to record her grandma’s most cherished memories and stories. One night, Roberta revealed an usual dream she’d had, where a future, time travelling version of Pri and her sister came to visit. They promised to take Roberta back into the future and cure her cancer, using a time travelling chair that would also enable her to explore and see the world once again. Roberta remarked how she missed the outside world, in particular how she could no longer step into her own yard. Her favourite pastime was caring for the garden. Because of her previous experiences with customer services, Pri didn’t expect to hear back anytime soon. 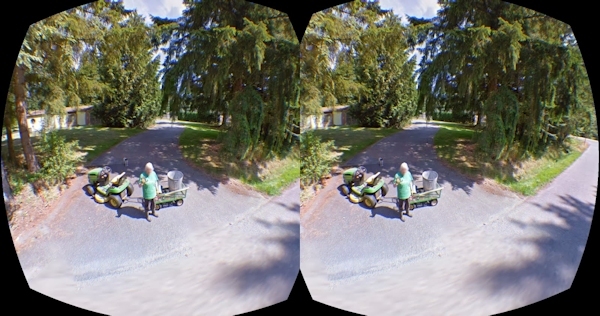 The doctors had given her grandma one to two months to live, so there was little chance she’d get to experience the outside world again via the Rift headset. However, the next day an email from Kevin Crawford, Oculus’s Customer Service Lead, was sitting in her inbox. “I pretty much cried at my desk reading it,” said Pri. The team forwarded this to me for review today. Thank you very much for the heartfelt email. We’re all really sorry to hear about your grandmother and can sympathize/empathize with your situation. The email has made its rounds within the Support group and it was a unanimous decision that we needed to help you out. Unfortunately, we can’t send you out a brand new unit as we’re still trying to fulfill our backlog queue of existing orders, but, we have just received a few developer loaner samples back in the office. Keeping with the spirit of these specific Rifts, it only makes sense that we loan a working developer Rift to another game dev. This industry can be brutal when you work from project to project. Games get shelved, cancelled, or completed, but regardless of the reason, the work is done, and it’s on to the next adventure. We’re in this industry because we are passionate about what we do and I can see from your website, and your art, that you are passionate about what you do. I’ll work to get one of these Rifts out the door to you today if I can. Please provide me your address, city, state, and zip. I’ll take care of the rest. That night, Pri loaded up Street View and handed the Rift headset to her grandma. “I could see her smile really wide as she looked around. She smiled as she looked herself up and down, but then it started to fade as she remarked: I look so healthy there…” Standing behind Roberta is Spec, her dog who had died just months earlier. “Look how young Spec is,” Roberta said, then asked Pri to stop the feed. As she wiped away a tear it was obvious she’d had enough for the day. A few days later Roberta was compiling a list of all the places she wanted to visit on Street View using the Oculus Rift. In the meantime, Pri had gathered a handful of friends and colleagues who worked as artists and game developers. An ambitious plan was formed: to create a unique VR experience for Roberta to explore and enjoy, filled with butterflies, waterfalls and a forest with fairies — all the things that Roberta loved and talked about. “We had pushed out a couple concepts and a few models,” said Pri, “but four days in, my grandmother’s cancer had suddenly spread and she was too weak and confused to use it.” The Project was cancelled. Roberta’s experience with the Oculus Rift only hints at the possibilities that virtual reality affords. It’s escapism in its most visceral form, transforming the lives of those with severe and crippling limitations. The Rift headset enabled Roberta to walk again, to reach out at virtual butterflies, and to forget all of her problems if only for a brief moment. In the videos comments section below Pri’s video, mdbuehler describes how he visits assisted living homes, and uses the Rift to let pilots and veterans fly again. It’s just another example of how this new technology is being used for the benefit of others. Gamers have dreamed about virtual reality for decades, imagining themselves in the cockpits of spaceships, or firing a virtual weapon at foes, but Roberta’s story gives hope of something far more profound: of changing lives for the better. We’re only just beginning to discover new ways of using virtual reality to explore the world, to aid those suffering from illness and to better the lives of others — and we have far to go — but as Roberta, Pri, and the Oculus team have shown, there’s much to be hopeful for.